SHE’S a South African jazz legend who’s travelled the world wowing audiences with her silky smooth voice. She’s dined with presidents and performed with international stars – but Thandi Klaasen’s phenomenal success has also been tinged with tragedy. 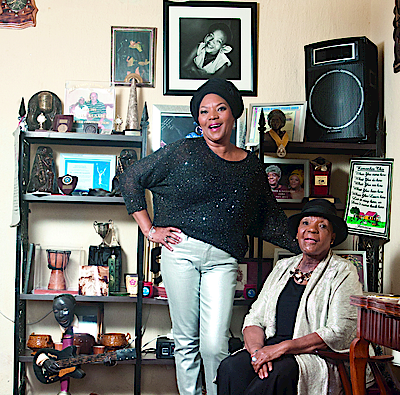 Mam’ Thandi is 80 now, and at an age when most people are retired and taking it easy she’s still looking for gigs to help supplement the meagre pension she survives on. Not that she hadn’t saved for a rainy day. She had a substantial nest egg of R100 000 for her old age but two years ago, while she was visiting her daughter in Canada, someone broke into her house and walked off with her TV, hi-fi and other household appliances. “But what hurt me the most was they also emptied my bank account. I worked hard for that money and it took me years to save such a big amount,” the singer says with tears in her eyes. But the woman who welcomes us into her old four-room house east of Joburg with hugs and kisses has been through tougher ordeals – and if anyone can survive a mere robbery, it’s Thandi Klaasen.